Diary of a Miner: The many signs of HoN Co.
Leaving the rigging and platform behind, we set off straight ahead, just to the left of where we had mined the glowing stone. We hadn't ventured in this direction the last time we were here, so maybe there would be signs of HoN Co.'s presence close by. Numerous roaring fires nearby, some small and seemingly well contained, as well as large ones that seemed to be spreading along the walls, provided more than enough light for us to see by. That and the large, concentrated crystalline structures of glowing stone suspended above on the ceiling allowed us to see way off into the distance. As we climbed down to the bottom of the hill, I had begun to wonder why there were no indigenous creatures anywhere to be seen. 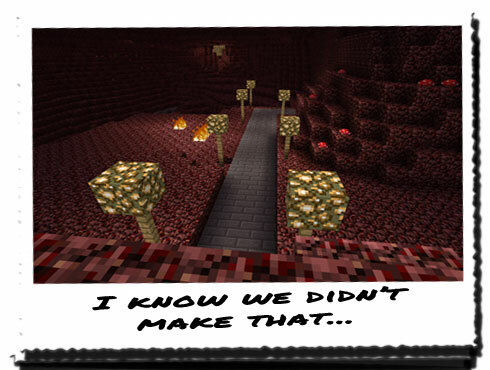 Despite the fact that Creepers, giant spiders and the undead were all meant to originate in the Nether, there was no sign of activity at all. Last time we had been here, we had encountered a strange species which seemed to be part man and part pig. They had seemed incredibly curious about us, and had investigated us on more than one occasion. Now there were none at all... I was almost hoping to see one of those strange floating ghost-squid things, just so I knew everything was normal. "Maybe it's not something that's scared them... Maybe it's the complete opposite. Maybe something has attracted their own attention away from us to a different location..."
That was another possible theory, but it did little to ease my nerves. Whether something had driven them off or attracted them to somewhere else, it still wasn't a good sign... HoN Co. were definitely up to something here, and judging from the look on THEROS's face, he was determined to find out what! As we reached the bottom of the hill however, we stopped and just stood agape at what lay before us. We looked at each other, slightly in shock at what we had found; it seemed to be a strange roadway that led both away from us and towards us, only the latter seemed to head beneath us into the bottom of the hill. The roadway was also lined with wooden posts with large chunks of glowing stop atop them, making a very useful and resourceful light source. "Where do you think that leads...?" "Good point... This has to be the work of HoN Co.! I know I don't know much about the Nether, but if the creatures that originate here can build this, there would be signs of it all over the place. Let's see where the path goes off ahead of us... It disappears at one point..."
"If this road is here, that means so too are HoN Co. ... We're going to have to be careful about how far we go. We could run into a patrol of guards or scientists..."
"True... On the upside at least we can't get lost. It's going to be pretty hard to lose the trail back to the camp." 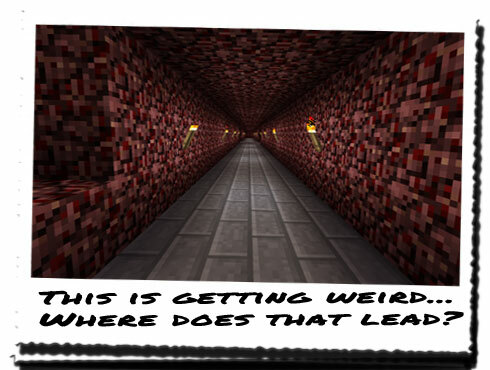 Reaching the end of the pathway, we turned to the right to follow it, and found that it had dug its way through an entire wall of the strange Nether rock. HoN Co. had been very busy in our absence, especially when you consider that they too may be exploiting the time lapse that occurs between the two dimensions. It must have occurred to them at some point that something was a little off with the timing, and it didn't take much for us to realise the potential of this effect. The tunnel that had effectively been created before us was long and surprisingly consistent the entire way along, as though it had been carved out with machinery rather than by hand. We followed it the entire way down, stopping midway to inspect a rather odd break in the uniformity of the tunnel walls. Off to the left and right were paths that split off the main road and disappeared into darkness. Deciding that it would be best to stick to the straight and narrow, we continued along the same path. Even though we couldn't see any HoN Co. guards along the route, THEROS was still edgy, and tried to involve and element of secrecy in his movements. We reached the end of the tunnel, and found it veered off to the right once more. "Where do you reckon this leads to? It's got to be pretty far away from the camp, which makes me wonder how they even found the platform and rigging..."
I reminded him that there was also the other path that led in the opposite direction to where we had gone. Who knows where either direction led. Off in the distance we could see a change in light level and assumed we were nearing the end of the tunnel. Once there, we realised that the tunnel had ended rather abruptly, with a fall about one hundred feet to the stone below. But that wasn't what had captured our attention. Off in the distance, off to the left was a large cobblestone structure, seemingly suspended over a massive lake of lava. A small path led from beneath us, across the lava lake and into the centre of the structure, we seemed to have no real purpose from the outside. "What in the... Is that a...? We've got to go back! COLUS needs to see this, with his own eyes!" THEROS grabbed me before I was able to take a photo of it, and before I knew it, we were racing back along the roadway, along the tunnel, back to base camp.